Google Chrome is making it easy to cast local files. 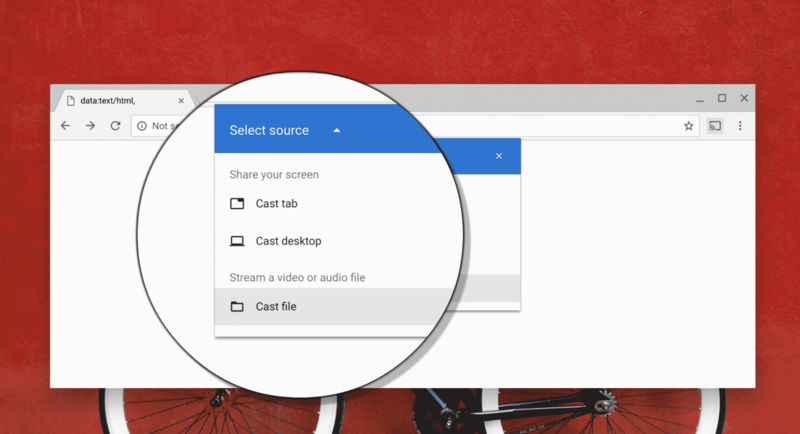 A new option called "Cast file" is coming to Chrome. Click "Cast…" (or the Cast icon) in the browser menu, click down arrow ▼ next to "Cast to", and "Cast file" to select the local file on your machine you want to stream. And that's all! I tried this on my Pixelbook running Chrome OS Dev channel and it seems to be working! Chromecast users have been asking for a solid solution to cast local files, for a long time now. Mirroring the entire screen was available as a workaround, but the new feature will make Chromecast much more attractive and easy to use. [Local Media Casting] Automatically fullscreen local media casting video files. This change adds back a previously removed blink API on WebElement to fullscreen an element. This API is then wired up to media router UI and the local media casting flow to fullscreen the first video element as soon as it is loaded. I still need to know what are the file types supported. I will update this post as soon as I find that out! If you have some more questions on how this feature works, drop me a comment and I'll help you find answers!